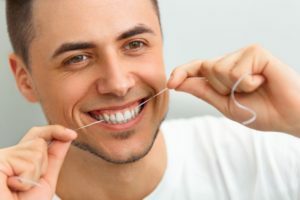 Flossing – Your Dentist in Melbourne Says It’s Super Important! You’re no stranger to the fact that flossing is recommended as part of your oral hygiene regimen, but you’ve mainly only heard about it serving as a means to remove food lodged between your teeth. Your dentist in Melbourne says there is so much more to it, though. She’ll explain the benefits of flossing and how it serves as a major part of preventive care as you continue reading. Contrary to some beliefs, flossing does far more than just remove food lodged between your teeth. It also plays a huge role in the health of your gums, removing harmful bacteria that could fester into big problems. Thus, flossing helps to prevent these serious issues by cleaning the areas that your toothbrush can’t. If you’re still leaning toward just using a toothbrush for your oral hygiene, consider the fact that you can only clean 60 percent of your teeth. To address the other 40 percent of the surface of your ivories, you have to floss. From this standpoint, flossing is just as important as brushing. Plaque Removal – From a more functional perspective, your flossing habits are key in fighting bacteria, as we’ve discovered. It also fulfills an aesthetic purpose, because tooth decay leaves severe visible traces over time. It’s common in these cases for teeth to be black or brown, so improved oral hygiene is a “win-win,” because it serves several purposes in one application. Fighting Stains – Flossing also serves as a major foe of food and beverage stains. Again, it’s because of the thin piece of floss’s ability to penetrate the tight space between the teeth. In doing so, it’s able to address 40 percent of the cause of discolored teeth. To get the best results, you should floss after every meal, along with brushing your teeth. At a minimum, though, it should be done two times a day. It’s especially important to floss at night before retiring for bed and in the morning when you rise. This is because during the time that you’re sleeping, bacteria have the opportunity to grow without being disturbed. So be sure to clear away excess food particles and bacteria at night and then address any new growth that may have accumulated, in the morning. To learn more about how flossing can enhance your oral health and prevent dental issues or to schedule a preventive care visit, reach out to your Melbourne dentist today! Since graduating with her DMD degree from the University of Florida College of Dentistry, Dr. Beverly Rose has been delivering top-notch care to her patients. To stay abreast of the latest changes, she remains affiliated with several professional organizations, enhancing the patient experience at her private practice. Dr. Rose can be reached for more information through her website. Comments Off on Flossing – Your Dentist in Melbourne Says It’s Super Important!